Southampton, PA —AdvantaPure has introduced the AdvantaTube Sealer and the AdvantaTube Sterile Welder. The two machines, specifically designed for biopharmaceutical process applications, are preprogrammed to seal and weld the company's biopharmaceutical grade TPE (thermoplastic elastomer) tubing, AdvantaFlex. "Customers have been asking us about welding and sealing equipment for AdvantaFlex," notes David Schwass, Director of Sales. "They wanted something that's made to work with our TPE tubing, because it lets them use a single tubing material in their processes." Pharmaceutical manufacturers typically use silicone or TPE tubing for single use fluid transfer applications. Their processes involve disposable molded manifolds, tubing assemblies, peristaltic pumps, and the need to retain product samples. Silicone has been a popular choice for years because of its cleanliness, performance properties, and suitability in pumps. But the material presents a problem when it comes to sample retention. Sections of tubing must be permanently and securely sealed off – a task silicone cannot manage. Tubing also needs to be welded, open end to open end, which is another function not possible with silicone. TPE tubing like AdvantaFlex, however, is sealable and weldable. It, too, works well in peristaltic pumps, may be molded to form sampling and batch filling assemblies, and exhibits low levels of extractables. 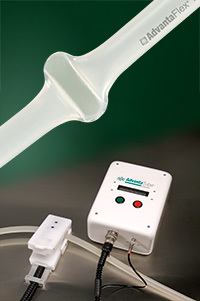 AdvantaFlex has become a practical selection for pharmaceutical and biopharmaceutical processing applications, and with the availability of the AdvantaTube Sealer and Sterile Welder, manufacturers have the benefit of one tubing material – TPE – for their processes that meets their sealing and welding requirements. The AdvantaTube Sterile Welder produces tubing welds, where two open ends of tubing are heated and joined to form a leak-free, single length of tubing, easily and quickly using an automated process. The welder maintains the sterility of wet, dry, or fluid-filled tubing and works with gamma irradiated and autoclaved AdvantaFlex. It's a rugged, table top unit that features an average cycle time of three minutes. The welder is provided with heat and time settings for AdvantaFlex tubing, although settings for other TPE tubing are available. Compact and portable, the AdvantaTube Sealer offers simple operation like the welder. Its convenient ten-foot cord connects to a base and allows users to bring the remote sealing head to the tubing; operation is not restricted to a specific location as with other table-top based tubing sealers. 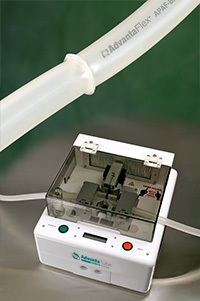 The unit uses heat and compression to securely seal fluid-filled or unfilled tubing in one-and-one-half to two minutes. The AdvantaTube Sealer and Sterile Welder work with tubing wall thicknesses from 0.0625" to 0.125" thick and are designed for tubing with an O.D. of up to 0.75". Both are supplied with certificates of compliance and one year warranties. In addition to their standard 110 VAC power inputs, 230 VAC and various plug adaptors are available. For more information on AdvantaTube Sterile Welder and the AdvantaTube Sealer, contact the AdvantaPure team at 145 James Way, Southampton, PA 18966; phone 888-755-4370 or 215-526-2151; fax 888-258-4293 or 215-526-2167; e-mail: sales@advantapure.com.